Daniel will aim to develop a deeper understanding of mesoporous silica formulations by investigating four key areas: (1) Uptake of API into the silica, (2) interaction of API with the pores, (3) release of API from the pores and (4) interactions with precipitation inhibitors. This newfound fundamental understanding will be used to develop an industrial score-card to aid in the decision making process surrounding the selection of mesoporous silica as an appropriate bio-enabling formulation in drug development. Daniel’s research perfectly fits in the context of a recently escalating interest in mesoporous silica formulations for the oral delivery of poorly soluble active pharmaceutical ingredients. In spite of a large number of recent publications demonstrating the utility and efficiency of mesoporous silica, there are key gaps in the fundamental understanding of this technology and the underlying principles that govern its efficiency and ultimate success. 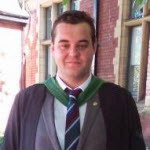 Daniel received his Bachelor of Science and his Master of Chemistry in Industrial Medicinal Chemistry from the University of Leeds (2012-2016). His master’s thesis was entitled “The Controlled Delivery of Doxorubicin from Novel Biodegradable Polymer Nanoparticles”, which was awarded the prize for the Top Master’s Research Project (University of Leeds, 2016). Moreover, he reveived the Craig Jordan Prize for Medicinal Chemistry (University of Leeds, 2016) and the Salters’ Graduate Prize (The Salters’ Company, 2016). Daniel has also already gained industrial experience at Pfizer (2014-2015), where he worked on a project surrounding the “Solubility Enhancement of Orally Delivered Drugs with Mesoporous Silica”. In December 2016, Daniel was awarded the The Salters’ Graduate Award, a national UK prize awarded to 5 chemistry graduates nationwide, for achievement in their MChem degrees (read more).